Kenneth Woods has already made his mark, conducting the Orchestra of the Swan, in a notable series of Avie recordings of Hans Gál’s orchestral works. Here he dons another hat, as cellist of the trio Ensemble Epomeo, and carries the good fight into the realms of Gál’s chamber music, for the principal pieces on this disc are that composer’s two works for violin, viola and cello, and very rewarding they are. The Serenade in D, Op. 41, composed in 1932, when Gál was at the height of his powers strikes me as a real discovery. In his booklet notes Woods notes the obvious debts to Haydn and Mozart and to the serenade genre as a whole, yet it strikes me very much as a work of its time. The big opening movement, Capriccioso, Allegro assai, is harmonically complex and imaginative, reminding us that this is the work of a contemporary of Hindemith and Zemlinsky. If the other movements—a beautiful Cantabile, a Menuetto and a concluding Alla Marcia—refer more clearly to classical models, they do so with wit, resource and a decidedly “contemporary” spin; and there is enough going beneath the surface in terms of harmonic ambiguity to justify interpreting the work in the light of the anxious political times in which is was written. This Serenade deserves to be set beside Gál’s four string quartets, recorded some years ago by the Edinburgh Quartet on Meridian, as one of his most important chamber scores. 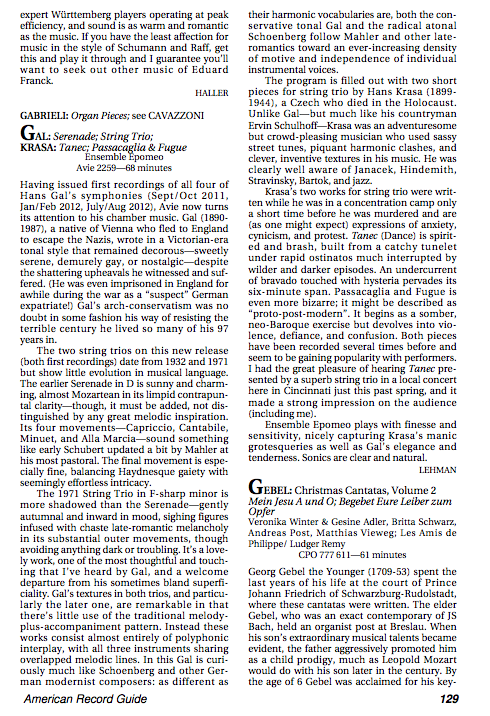 Nearly 40 years separate the Serenade from Gál’s late Trio in F-sharp minor, Op. 104, which was written in 1971 on a commission from the London Viola d’Amore Society and was originally for the line-up of violin, viola d’amore and cello (Gál made the version we hear on this disc, for standard string trio, simultaneously with the viola d’amore version, which would interesting to hear also). This too is a substantial work, in what seems much more a “late,” essentialized style—yet one which also looks back to the great nineteenth-century Viennese traditions of which Gál felt himself to be heir—not with much nostalgia but with decorum and respect. The extended set of Theme and Variations which serves as finale, especially, reminds me- though there is no exact equivalence in expression- of the similarly summing-up quality of the variation-finale of Brahms’s Clarinet Quintet. This is a cherishable utterance of wisdom and experience. While Gál, despite losing most of his family during the Second World War, survived in Scottish exile to a distinguished old age, his younger Czech contemporary Hans Krása instead had a brief sojourn as one of the most gifted of the composers crammed into the Terezin concentration camp, before being gassed at Auschwitz in October 1944. 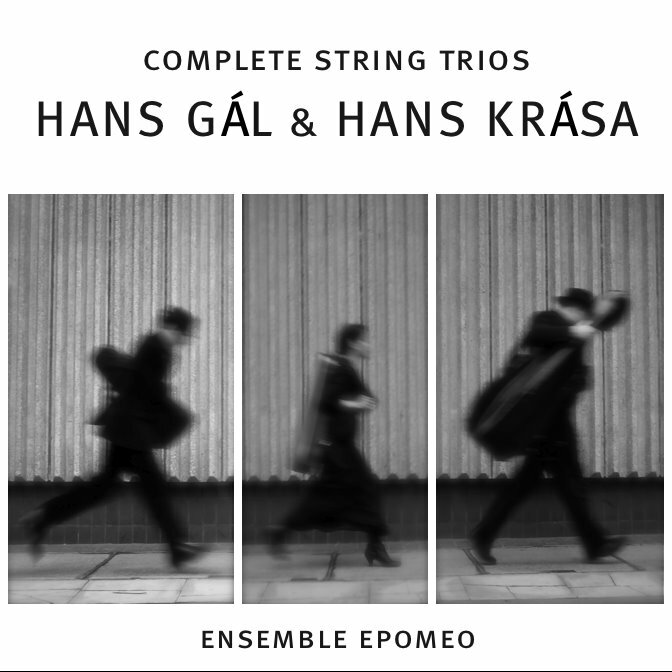 His two works for string trio date from that same year, and by now they have rightly been recorded several times—most notably up to now on a splendid Nimbus disc from Daniel Hope, Philip Dukes and Paul Watkins coupled with music of two other brilliant unfortunates, Erwin Schulhoff and Gideon Klein. In his openness both to the conflicting influences of Janáček (in the pawky Tanec) and Schönberg, Krása produced a music of vital symbiosis, albeit on a small scale in these two works. The Passacaglia and Fugue was in fact the last music he completed, and if I think I place this new recording slightly above the Nimbus rival it must be for the treatment of the Passacaglia, much more the substantial of the two movements, where Woods and his colleagues, adopting a very broad tempo, discover even deeper refinements of instrumental tone and character in differentiating the individual variations. 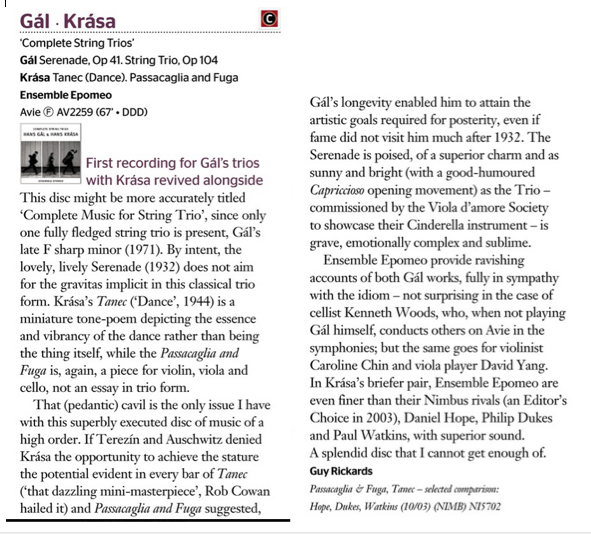 Indeed, all the performances radiate sympathy for the music and a focused intensity that bespeaks both familiarity with this out-of-the-way repertoire and considerable musicianship; these are not easy works to bring out in such vital and well-characterized interpretations. Avie’s recording, too, is splendidly resonant and warm. A very recommendable disc for anyone interested in either composer.